ILX Group’s accredited MSP Foundation and Practitioner blended learning is designed to help you become MSP-certified by using a combination of interactive multimedia training, workshops and paper-based exercises. ILX Group’s accredited MSP Foundation and Practitioner blended learning course contains all of the training and materials you need to attain both the Foundation and Practitioner qualifications in MSP. It combines interactive multimedia training, workshops, video, practical exercises, mock exam simulators, paper-based exercises and access to an MSP training expert throughout the entire programme including the two-day workshop. Important note: As of February 2015 all MSP Foundation exams must be undertaken and passed online via remote web proctor prior to attending the two-day Practitioner workshop. By helping to correctly manage a programme your organisation can reduce the level of risk involved and protect its investment in change. The MSP guidance provides you with the framework to effectively manage transformational change, ensuring it’s governance themes and processes are applied appropriately to suit your organisation’s circumstances. This course has been accredited and fully prepares you for the Managing Successful Programmes (MSP) Foundation and Practitioner examinations. 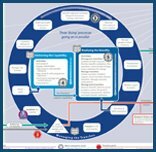 12 months access to the MSP Foundation e-learning, and a two-day Practitioner workshop which you will attend once you have compelted the e-learning. MSP Foundation exam: must be taken online via web proctor and pass confirmation received prior to attending your workshop (must be taken within 12 months of purchase). To assist your learning there is some pre-course reading and activities that must be completed prior to attending your course. In addition whilst attending your course there will also be some examination preparation evening work. The Foundation exam will be taken online via a proctor, and the Practitioner exam will be taken in the classroom at the end of the two-day workshop.